"Up to five prisoners sleep on the floor, without mattresses, in four square metre cells. They defecate in plastic bags and urinate in bottles. The corridors, littered with several days' worth of garbage, are often flooded by sewage." Although there have been several positive advancements in the past decade with regard to human rights in Argentina, very few steps have been made to improve the state of the criminal justice system. 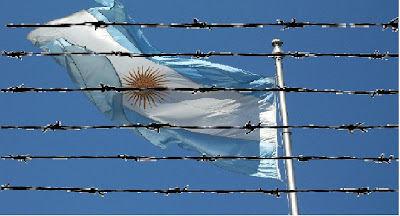 Human rights are still being violated in prisons and detention centers throughout Argentina, with these violations occurring at a much higher rate in those facilities that lie in the Buenos Aires province and in the western provinces such as Mendoza. Among the numerous problems that remain prominent in the Argentine justice system, one of the most alarming issues is the lack of reasonable sanitation, which is illustrated by the quotation that introduces this article. In addition, because of a very limited budget for the prisons, nutritious foods are scarce and meals are irregular for the inmates. This lethal combination of malnutrition and unsanitary living conditions leads to dangerous and unavoidable health risks for the prisoners. Unsurprisingly, the medical attention in these prisons is inadequate as well. According to reports conducted by Amnesty International of three prisons in the Mendoza province, the medical staff often is only brought in after an inmate has died. In addition to the absence of preventative measures, there is an insufficient supply of medicine and no medical records for the prisoners. If a prisoner is suffering from a medical problem, then they often intentionally cut or otherwise harm themselves in order to get the attention of the medical staff. However, the inmates aren't always ignored. Prison and detention guards routinely harass the inmates in a number of ways including making verbal threats, stealing clothes, or spitting in their food. Though, this heckling can seem very mild in comparison to certain other common practices of the guards. Argentine law prohibits guards to inflict harm upon the inmates unless immediate danger is clearly apparent. However, this principle is rarely enforced partly because only a small number of incidences reach the public. Of the cases of excessive violence that are presented to the Argentine government, still only a fraction of them are investigated. Ever since the last military dictatorship began in 1976, it has been standard practice of guards, police officers, and military officials to engage in brutality and torture. In some cases over the last three decades victims have been murdered following the acts of torture, which is not necessarily uncommon. As recently as 2005 several torture victims, or the families of torture victims, have reported the use of electric shock torture. In June of 2006 a 15-year-old boy, who was suspected of stealing a television set, was kidnapped, beaten, burned, and eventually shot three times in the head by two Navy officials and a civilian. The nature of this homicide case replicated methods used in the "Dirty War" era of the 1970s and 1980s, which shows that the mentality of the most violent period of human rights violations in Argentina is still lingering 15 years later. The kidnapping of this 15-year-old boy was just one example of an unjust arrest that, although is now less common than it was during the Dirty War, is still fairly routine under the current laws. The law does prohibit arbitrary arrest and detention; but, as with several components of Argentine law, there's a lack of accountability of the police and military officials, who have become accustomed to this acquired sense of "invincibility." The law allows a police officer to detain a suspect for up to ten hours without an arrest warrent, but the officer usually exceeds the ten hour limit. Since the internal panels that are supposed to control police abuses are usually weak, the police officer is left with more than enough time to harm the suspect. In addition to a lack of control over police abuse, each province has its own individual police force, which all vary significantly in skill, regard for human rights, and degree of corruption. It's obvious that there are inconsistencies in the law which, with an absence of accountability, creates an unjust leniency in the policy of arresting suspects. Another issue that is in need of legal revision is public trials. Many complaints have been issued about the unfairness of trials in terms of inefficiency and subjectivity of the judges, who have been accused of being easily manipulated by political influences. However, the main problem with public trials in Argentina is that they lack punctuality. It is not uncommon for a suspect to spend a number of years in prison before they are given a court appearance. With the poor conditions of the facilities, the suspect could leave the prison with compromised health, even if they're found innocent. Another problem with this situation is that the prisons and detention centers reach, and exceed, maximum capacity very quickly. Argentina's prisons are already deficient in space, so holding guilty and innocent people in the cells will obviously create extreme overcrowding. This overcrowding effect, combined with the unsanitary conditions, results in a miserable and torturous experience for the inmates. To see a typical Argentine prison cell, follow the link directly below. Relative to the efforts of the government in the 1980s and 1990s, Argentina has taken positive steps in giving justice to the victims of the human rights violations from the Dirty War era. The "Full Stop" and "Due Obedience" laws of 2005 have enabled the court system to convict several guilty police and miliary officials, some of whom were principle violators in the Dirty War. In fact, investigations are still progressing in Argentina. On July 2, 2010 the former Argentine dictator of the last military dictatorship, General Jorge Rafael Videla (shown above), went on trial to face new charges of crimes against humanity. Videla, now age 84, once denied the disappearances of thousands of political adversaries. However, in his 2001 biography, "The Dictator," he claimed to the authors: "I knew everything that happened. I was above everyone." 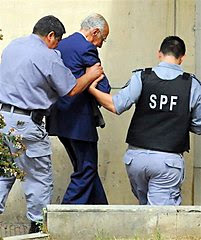 The conviction of the ex-dictator Videla, who is sharing a courtroom with 23 fellow defendents including former army General Luciano Benjamin Menendez, is undoubtedly a significant accomplishment for the criminal justice system of Argentina. However, there is still much more to achieve not only with respect to the conviction of the many remaining violators from the Dirty War period that are still free, but also regarding the restructure of the legal system so that there's accountability in the prisons, where human rights violations still take place. After all, prevention of human rights violations is the ultimate goal for Argentina in its persuit of a stable democracy and judicial system. "In the years of the dictators in Argentina, I was a political prisoner. The jail where I was held was worse than a jail-- it was a concentration camp for people fighting the dictorial regimes of Pinochet, Bordaberri, and Videla." "Amnistía Internacional Argentina." Inicio | Amnistía Internacional Argentina. International Amnesty. Web. 7 July 2010. . "Argentina." U.S. Department of State. Bureau of Democracy, Human Rights, and Labor, 6 Mar. 2007. Web. 7 July 2010. .
"Argentina | Human Rights Watch." Home | Human Rights Watch. Human Rights Watch. Web. 7 July 2010. .
Rey, Debora. "Argentine Ex-Dictator Faces Human Rights Charges - ABC News." ABCNews.com - Breaking News, Politics, Online News, World News, Feature Stories, Celebrity Interviews and More - ABC News. Associated Press, 2 July 2010. Web. 7 July 2010. .
Suarez, Willie. "Prison Blues, Blues Music." Blues for Peace. Web. 7 July 2010. .
Valente, Marcela. "ARGENTINA: 'Cruel, Inhumane' Prison Conditions in Mendoza - IPS Ipsnews.net." IPS Inter Press Service. 24 Nov. 2005. Web. 7 July 2010. .